New York City Mayor Bill de Blasio announced a plan Thursday to protect lower Manhattan from rising sea levels by surrounding it with earthen berms and extending its shoreline by as much as 500 feet. Andrew Siff reports. New York City Mayor Bill de Blasio announced a plan Thursday to protect lower Manhattan from rising sea levels by surrounding it with earthen berms and extending its shoreline by as much as 500 feet. 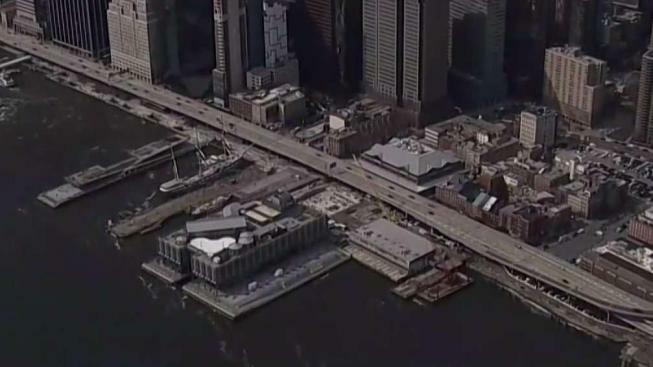 Officials have been developing schemes to fortify New York City's waterfront ever since Superstorm Sandy destroyed thousands of homes and businesses in 2012. De Blasio says the city could fortify most of lower Manhattan with grassy berms and removable barriers for around $500 million. But protecting the very lowest-lying areas in the old Seaport District, from the Brooklyn Bridge to the Battery, will require adding more land over several years at a cost of up to $10 billion.